Point of view is proud to announce that one of its members, Antonio Scarponi, has been nominated for the prestigious Curry Stone Design Prize. The Curry Stone Design Prize is awarded every year to breakthrough design solutions with the power and potential to improve our lives and the world we live in. The Curry Stone Design Prize recognizes exceptional, emerging design innovations that contribute to the vitality of the world community”. – from the Curry Stone Design Prize website. Antonio’s practice takes place at the intersection between contemporary art, design, architecture and social engagement. Intertwining these discourses creates a framework that enables him to engage in the sheer complexity of the societal issues his work deals with. It renders Antonio an independent position where he can situate a critical and “subversive” practice of imagination. 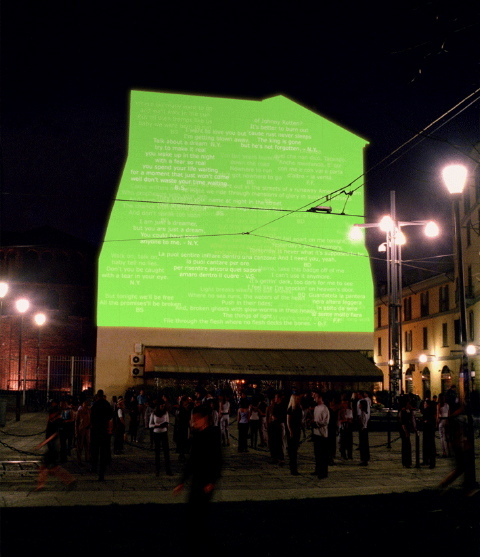 Since 2004 Antonio has been working – in collaboration with Stefano Massa, Federico Pedrini and Antonio De Luca – on the Dreaming Wall project, a public space installation originally designed for Milan. It’s a green-coloured UV light sensitive wall that turns white when light falls on it. At night it displays text messages send by phone, or submitted on the Internet. A computer controlled UV laser beamer projects these text messages that last for fifteen minutes on the wall and then dissolve again. The project is a hacking of public space; it drifts away from the functionality of everyday life and creates what Antonio refers to as “the sub consciousness of a city asleep”. On a personal level we enjoy working with Antonio, who has a beautiful mind, and a critical and passionate attitude that brings energy and innovative ideas into our collaboration. Read an article Antonio recently wrote about his “RIKEA” project. The Curry Stone Design Prize. And read their article on Antonio’s practice here.